Pavement ants get their name because their nests are often located under pavement, concrete slabs or large stones. They were introduced from Europe by the early colonists. Outdoors: Under stones, under pavement, building slabs and next to buildings. They enter buildings through cracks in the slab and walls, slab expansion joints and the natural openings of buildings. Indoors: Walls, insulation and under floors. Nests often are found in ground-level masonry walls of the foundation and especially near a heat source in the winter. They often follow pipes running through concrete slabs for access to upper floors of buildings. Swarmers emerge from expansion cracks/joints, from around floor registers and from under baseboards. They will crawl up masonry walls and emerge into false ceilings and then come down into occupied areas below commercial buildings. Colonies are moderately large, averaging 3,000-4,000 ants and several queens. Workers are not aggressive, though they can bite and sting. In general, pavement ants are just a persistent nuisance. Light brown to black with paler legs and antennae. Light brown to black with paler legs and antennae. 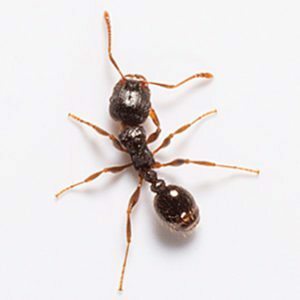 Workers measure 1/16-1/8 of an inch (2.5-3.0 millimeters) long; queens about ¼ of an inch (6 millimeters) long. Majority of the eastern half of the United States, as well as in California and Washington. Pavement ants will feed on almost anything, including live and dead insects, insect honeydew, seeds, plant sap, and household foods including nuts, cheese, honey and bread, with a preference for meat and grease. Development varies from 36 to 63 days. During warm weather and following a significant rain event, huge numbers of winged reproductives may emerge from their nest, but can appear inside at any time, including in winter months. Finding and treating their well-protected nests is difficult. Otherwise, only partial control can be achieved with perimeter or area treatments.